The new MacBook Air for 2013 has outstanding battery life thanks to its Haswell processor, but those power-sipping capabilities are no use when matched with Wi-Fi problems. Apple is hoping to solve users' Wi-Fi complaints starting today with a patch that is supposed to correct the MacBook Air's spotty wireless reception. 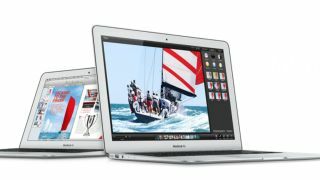 The notes for MacBook Air Software Update 1.0 describe the issues as happening in "rare instances" and may "cause an intermittent loss in wireless connectivity." With the most popular Wi-Fi troubleshooting thread on the Apple Support forums now running 50 pages deep, these "rare instances" seem to have gotten under a lot of MacBook Air 2013 owners' skin. The Wi-Fi patch is joined by a Photoshop fix that caused occasional screen flickering when running Adobe's premier image editing program. Finally, MacBook Air owners suffering from audio problems will be happy to know that this update also takes care of the volume fluctuation glitch that could occur during video playback. New laptop launches from Apple haven't been flawless, but it's positive to see the company address issues it deems "rare instances." This update comes a little more than a month after the 2013 MBA's launch, when Apple could have easily ignored the problems until the Mac OS X 10.9 Maverick release this fall.